It’s true. I’m a bit behind. I’m looking at the calendar today and I’m a little in shock that we’re already in May! But ever since Tyler’s birthday last week it’s been go-go-go including an out-of-town trip just for me! So, if you please, let’s rewind to last week! 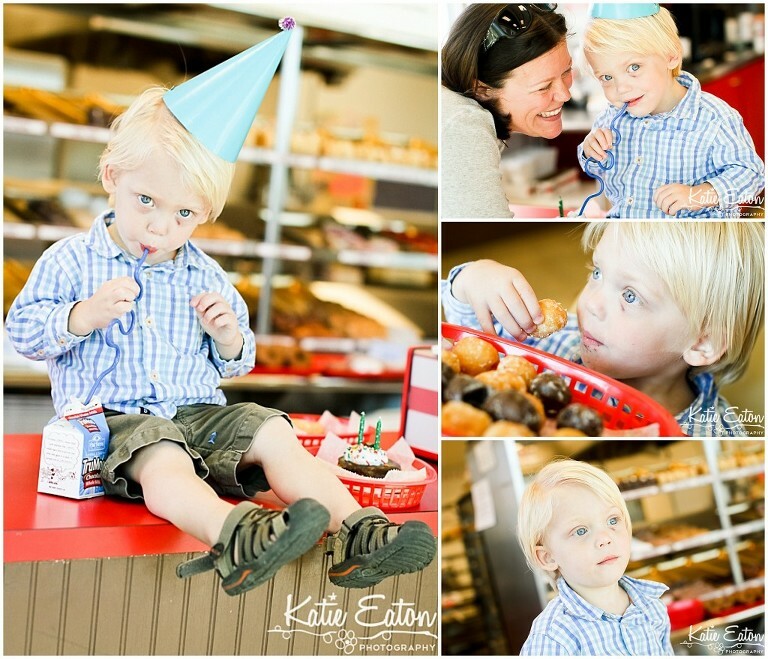 Tyler turned two on Tuesday and we started out day at ( I’m sure you will never guess) … the donut shop! And I had him wear a party hat, brought my own cute straw and we did the birthday song right there on the counter! I’m a cheesy mom, it’s true. And the manager thought it was so fun that he brought out 2 dozen donut holes on top of the special donut I bought him. And then Tyler ate almost every.single.one. He didn’t really feel like sharing, “no share mama,” until his Aunt Marcia showed up and flashed him her gorgeous smile. That, and she told him she’d let him pick out his birthday present! So, Tyler got a few donut holes and I got a coffee. Which by the way, the coffee at most donut shops is really overrated. And, you don’t even have to look all that closely to see his little black eye. It’s like he *knew* I planned on taking his two year old pictures! Boys.